Summer is over, and so are your summer-specific selling strategies. Backyard party open houses, listing descriptions focused on outdoor entertaining potential, or even filling front porches with lush and vibrant flowers — put those away now. A new season = time for new tactics. 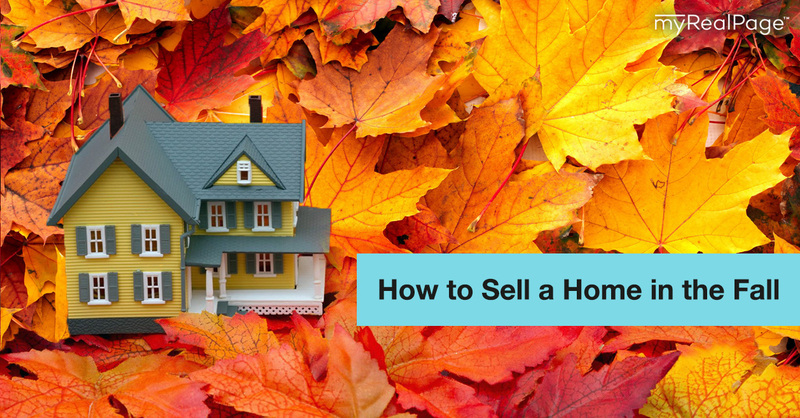 Today, we’re exploring five season-specific strategies to help you sell more homes this fall. Keeping lawns and yards free of fallen leaves and debris is a daily challenge in the autumn months. We might only rake our own properties once or twice in the fall, but when it comes to homes we’re selling, we gotta kick our raking game up a notch (or five). As long as there’s a ‘For Sale’ sign in the front yard, the lawns of your listed homes should be as free of dead leaves as possible. If you’re having an open house, that same level of care should extend to the backyard. Other outdoor maintenance to undertake or make clear to your seller: trimming back overgrown trees and bushes, removing withered summer plants and flowers, and removing any summer-y decor and furniture. When sweater weather approaches, everyone craves coziness. 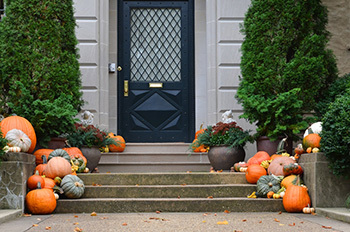 Appeal to that craving by creating fall ambience at your September to November open houses. Light candles in each room. But stay away from heavy scents; while some open house attendees may appreciate the vanilla-fig wafting through the house, others will be heading for the door. Reggae jams and the Beach Boys may have helped you create a relaxed, sunny vibe in the summer months. Now that we’re in fall, opt for an intimate, softer, maybe even folk-y soundtrack. Great fall picks include Bon Iver, Damien Rice, Sarah Harmer, and Nick Drake. When it comes to the snacks and beverages you offer up during open houses, trade slushy summer drinks and fresh fruit for spiced tea, apple cider, and pumpkin-everything baked goods. Just because summer’s brightest blooms have retired, doesn’t mean you should leave a home’s front porch devoid of any plant life and decor. Colours play a role in the buying process, so just opt for fall-appropriate colours like bold reds, oranges, yellows and purples. Marigolds, chrysanthemums and pansies are all perfect picks for the fall months. As Halloween approaches, you can accessorize with a pumpkin and various squash. 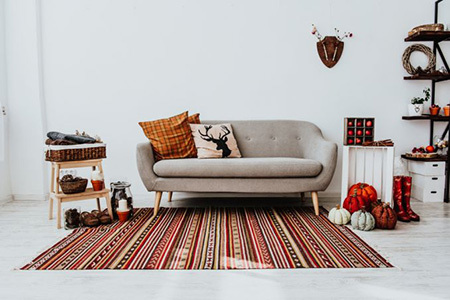 With the help of a stager or on your own, make a few small decor changes to your listings to help make them feel more seasonally-appropriate. Add throw pillows in rich fall colours and sumptuous fabrics, like velvet. Lighting dimmers are very inexpensive and easy to install. Being able to customize the level of brightness helps create a cozy fall mood. If your listing has a functional fireplace, you probably don’t want to be bothered with lighting and maintaining a fire during an open house. Instead, fill it — as a for-show fireplace — with lit pillar candles in glass vases. 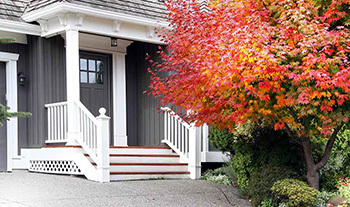 You can tailor your listing descriptions and social media promotion to be fall-specific, too. Is the house close to a forested trail system, or does it offer a view of trees? Mention the amazing fall colours. If the home features a beautiful working fireplace, describe cozy nights spent in front of a roaring fire. Even large kitchens and standout dining rooms can be a fall-selling feature. Using storytelling techniques, set the scene for prospective buyers by describing a big Thanksgiving meal spent with family and friends.